HANCOCK COUNTY, MS (WLOX) - The days start early for Josh Collins and his wife, Tonia. Getting prepared to paddleboard takes time. His mission comes from the heart. "If any one soldier that's touched by this that can find a way to fight their own battle, then that's a success," Collins said. He suffered a brain injury himself while serving 20 years with Army special forces. "Everything related to balance is all messed up, so my world is always moving. I got on paddleboard at a therapy event in Tampa at the VA hospital, and the world stood still," Collins recalled. On his journey, veterans come out and show support. Some, like Shane Clark, go a bit further. 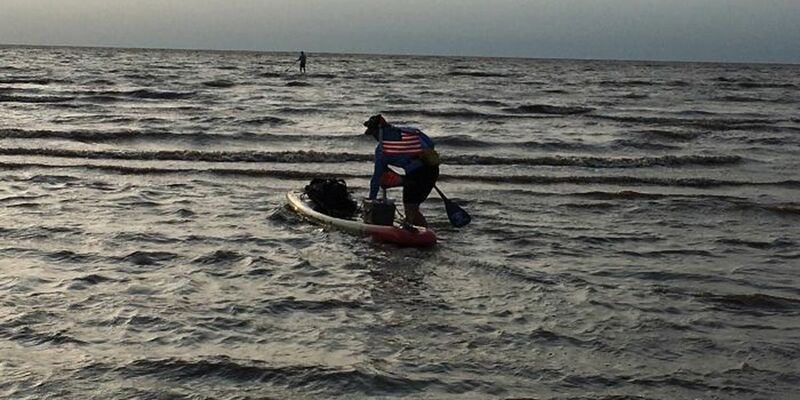 "I wanted to paddle to him, welcome him to Mississippi, see if I could get some media coverage for him to get the word out to as many people as possible," Clark explained. Tonia said this mission is like a new lease on life for Collins. "This is a tremendous accomplishment for Josh. To be able to get out and do things again. It's great, it's heartwarming," said Tonia. Before hitting the water, memory exercises are practiced with the help of a Rubik's Cube. When he does take off, Collins covers a lot of territory. "I'm doing 30 plus a day, and that's over open water and over all sorts of terrain," said Collins. Undertaking such a journey is no easy task. It takes a lot of a training, and it takes a lot of teamwork. For Collins, he has one very special teammate in Tonia. "She's everything in this mission. She is the support mechanism that makes all of this possible." With that kind of determination, anything is possible for Josh Collins.